Moby Grape rises just right of center and takes a wandering line for nine pitches to the top of Cannon Cliff. The Grape was first ascended by Joe Cote and Roger Martin in 1972. A mystery lives with the name - was it named after the British Rock group or was this the special drink Joe brought along for the day - Moby Grape Cool Aid? 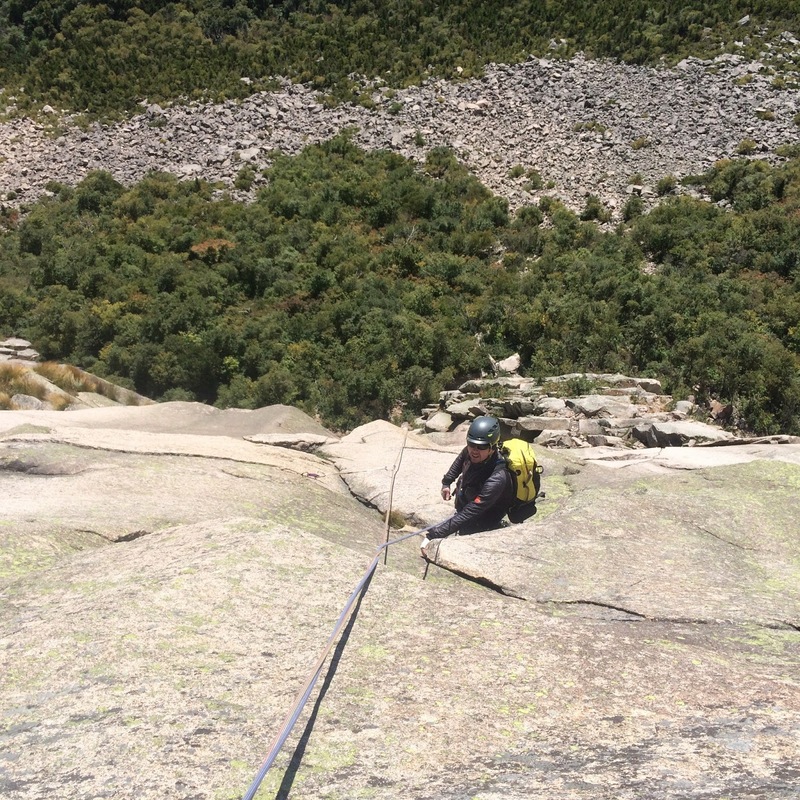 In the end Joe and Roger ended up climbing a fantastic 5.8 alpine rock line to the top. Today Moby Grape is one of the most climbed moderates on Cannon. 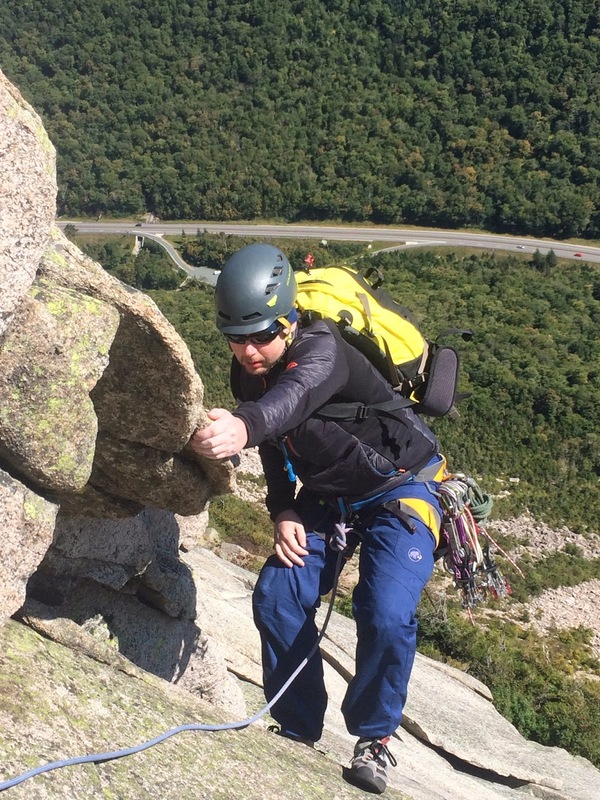 The rock on this route is mostly solid, the climbing is varied, and the route finding is intricate. A day on Moby Grape is a a true Cannon experience!!! The skies were bluebird on this late fall morning. As we arrived in the parking lot the wind was quite strong and the temp was around thirty five. It was Patagonia type weather - a great day to layer up with my Mammut Ultimate Hoody and give Moby Grape a go. The cliff faces east and the early morning sun was doing its job. The cracks were initially cold but the suns rays were heating the granite wall. Soon we would be stripping off the outer shells and truly enjoying the climbing and fall weather in the notch. A meet up on Cannon with a common goal - refresh, replenish, reboot. Grib on a wonderful 5.7 pitch in the middle of the route. 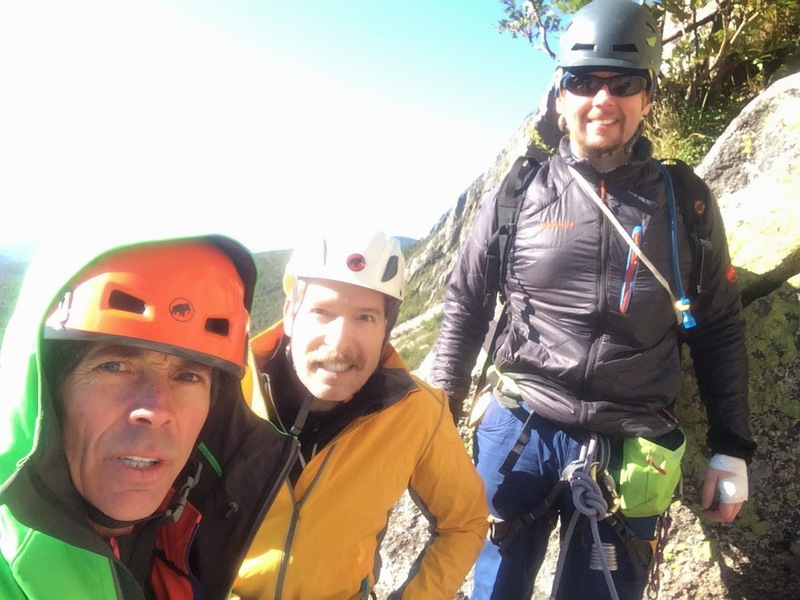 From Grib - "It was a great day out…And thinking about it more Moby might be one of my favorite climbs. 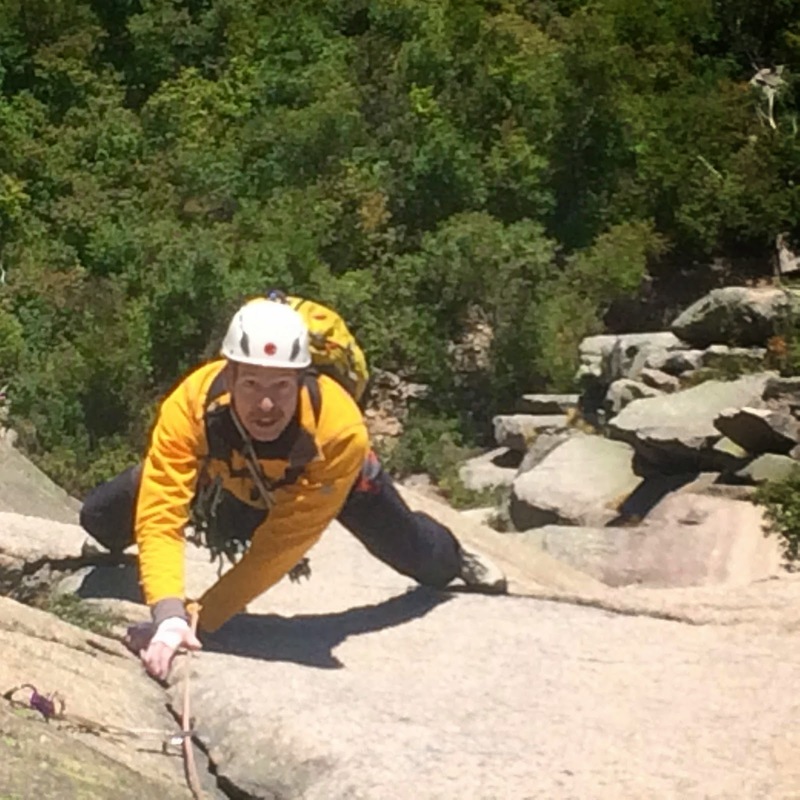 The quality and the variety of climbing on each pitch was just awesome!" A focused Bill on the striking layback finger crack. Bill getting into action - jamming the stiff 5.8 triangle roof pitch. Another spectacular view on Cannon - the clean big wall section in middle and the Whitney Gilman Ridge on left. Earning our vertical - Moby Grape keeps on giving. The climbing is varied with multiple cruxes along the route. 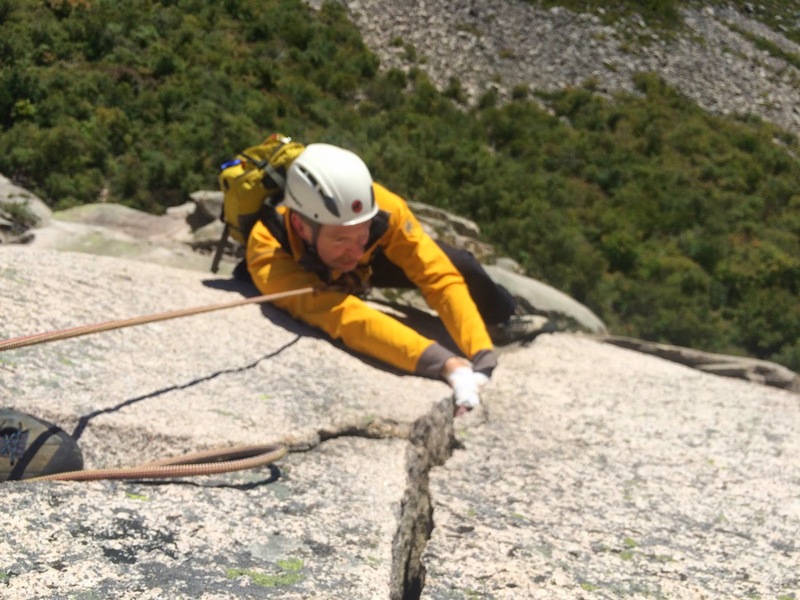 You must keep a delicate approach with footwork on the slab moves but be ready to get physical on the steep cracks, chimneys and overhangs. Grib in cruise mode as he enters the belay area below our final pitch of Kurt's Corner. 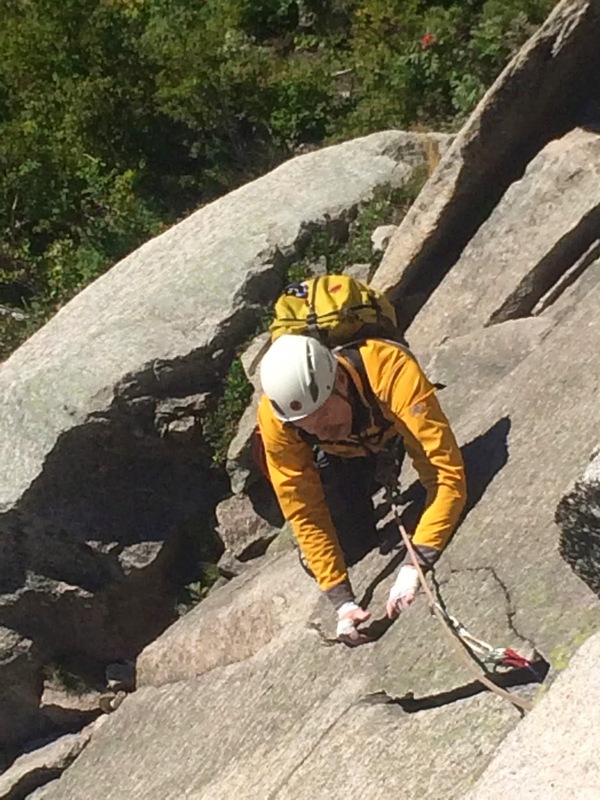 Kurt's Corner is a must do variation - a clean dihedral laced up with jam and layback cracks. Bill and Grib are in sync as the climb together to the top. Bill, Grib and I enjoyed a fine day on the wall.